Let us welcome you to our little corner of paradise. 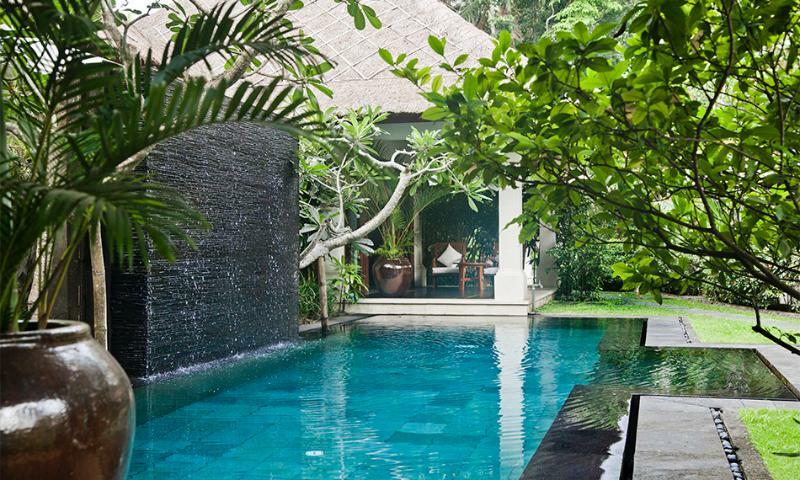 Villa Mawar is a secluded oasis couched in the Balinese Jungle in a hectare of beautifully curated gardens only a 45 minute drive from Denpasar airport. The villa itself is a refined and elegant space, specially designed for those seeking some timely rest and relaxation with family and friends. With six master bedrooms, a full waiting staff and breakfast included in the daily rate, there's the opportunity for everyone to fully relax. Within the gardens you'll find two pools, and a riverside Spa Centre and even a poolside bar; our staff are here to treat you and your guests to some serenity and luxury in the midst of the jungle. 'The place is amazing. Everything was taken care of; a fully stocked fridge (soft drinks and beer) and well trained staff to see to all our needs. The music system is awesome and it is everywhere you go. If you are looking for a personalised holiday where you are treated like royalty and also like family, then this is the place'. Winner of the Trip Advisor 2017 Travellers' Choice Award. Winner of the Trip Advisor 2017 Certificate of Excellence. Villa Mawar is located in the traditional village of Cepaka.